As I hope I established in Part 1, world-building is both a tremendous challenge and an unavoidable necessity for fiction writers. If you’ve been convinced, or just thought it worth chuckling about, here’s the next step. WHAT is this world I have to build? Two parts to this, and one of them I bet you’re already doing quite well. The Venn section on the right is the overlap. You don’t need to spend a lot of time over there, most likely. Here’s the part which I think most authors, honestly, do very well. You study your world. Maybe you take notes, or just daydream about it. Maybe it hassles you, or perhaps your muse is yammering at you all the time. This place, you know. In fact, you are the world’s leading expert on your world! I made the yellow-bordered area fairly large to represent this. But notice several things at once. 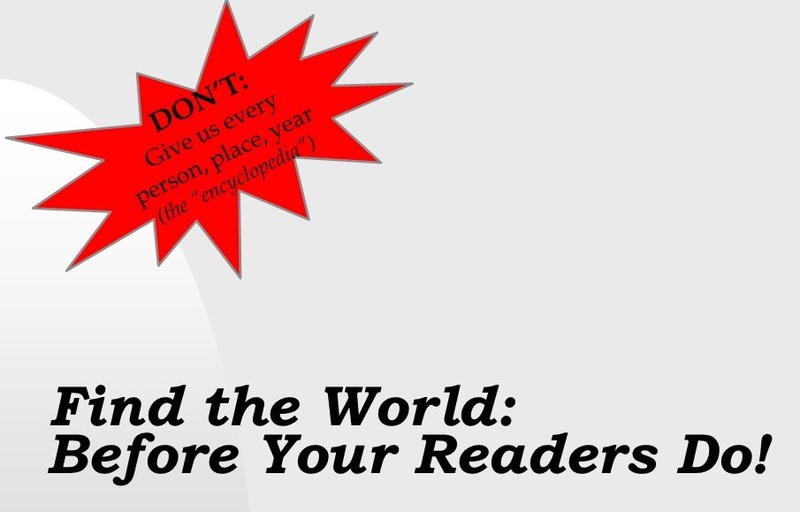 Your readers start out knowing nothing about your world. Not even the stuff that could be the same. Not a single thing. 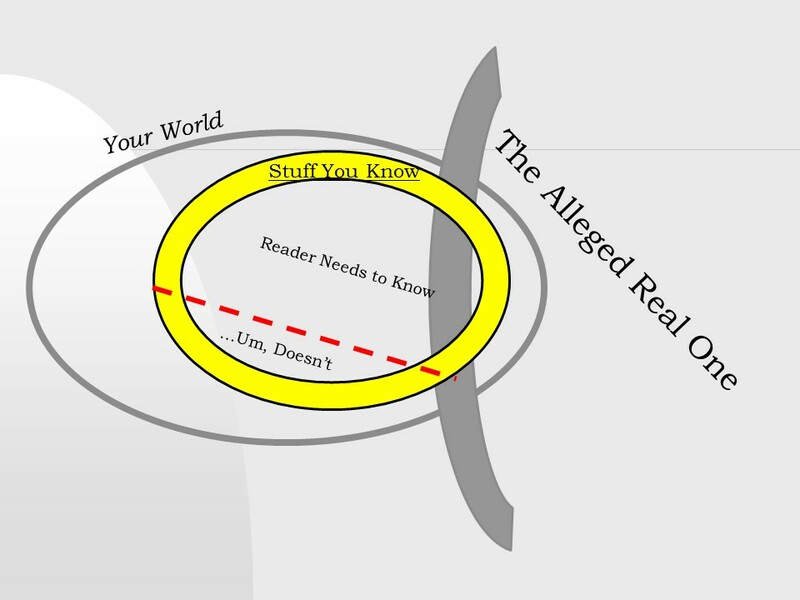 However, there probably are things about your world that even you don’t know ( the question-mark to the left of the yellow ring). 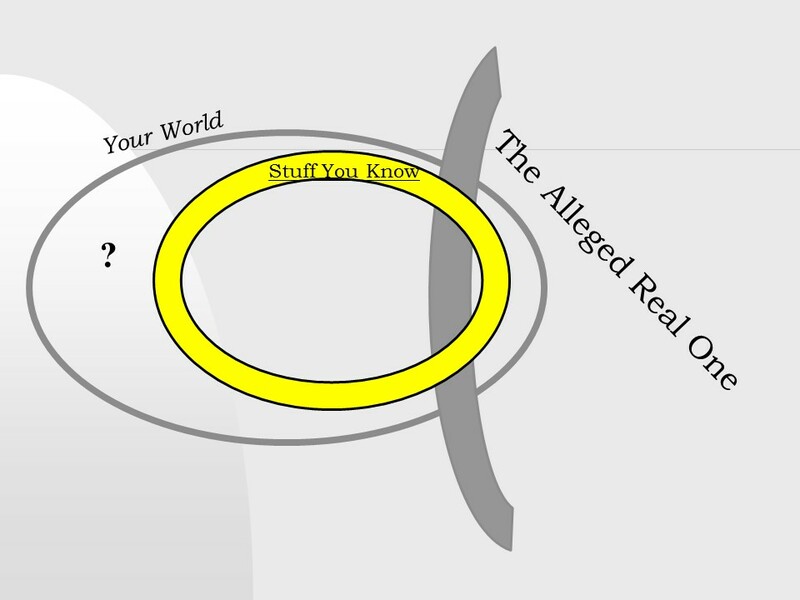 That includes whether a given thing in your world is just like it is here or not (the far right beyond the yellow ring). Heavy! If you’re still with me, I want you to take a moment and bask in the notion that you have achieved leading-expert status. Based on my own experience and conversations with 100% of all colleagues in the writing biz, it is justly a source of great pride. Sit back and reflect on how cool it is that no one can tell you more about the place your tale happens than you. That may also help you to define its borders, which is the point today. Also- I need you pumped up and feeling powerful, because now you have to do a tough thing. The most crucial step in world-building is probably the hardest. You must recognize that there are facts about your world that are true, and real, and coherent and all the rest of it… that your readers do not, in truth, need to know. You have to draw that line. And then– perhaps with tears in your eyes– you must start to respect it. I found this stuff out, and by gum, the reader is going to hear about it too. DON’T go into encyclopedia mode on the reader. Is this advancing the plot for the characters, right now this minute? Is it something those characters don’t already know? Will the reader care more about a character from reading this? You probably need three Yes answers to be safe. One is a bare minimum. You can also use length as a determinant. It’s not really a rule (unless I just made it up) but go with me. One sentence, maybe at the end of a chapter, or when the action turns from one place or character to another– one sentence of world-building stuff in the same place you can probably get away with. Something like that- and note, as stuffy and distant-historical as the sentence was, it was a Yes for the second question above. It’s a hook, it’s dramatic, you can get away with it. I suggest that at two sentences, the Patience Horizon starts setting again. That candle I talked about last chapter burns down, your time begins to run out. Now, go back and look at that three and a half page history lesson you’ve got jammed into the middle of the conversation in your murder mystery, or romance novel. Still think that’s worth it? You have to feel out the boundaries of your world, and make tough choices about which gems, of all the treasure you’ve unearthed, the reader truly needs to see. You can’t hold off on the job- the default setting of ARW kicks in. But your job is not to tell them everything you know- the Patience Horizon is shrinking. Most authors do a great job at figuring out what’s in their world, where it is. The good tales understand that “southern border”, and can distinguish between the body of facts and differences the reader truly must have to enjoy the tale and root for the characters. If you haven’t turned the pages on Gaston Leroux’s incredible genre-bending tale, don’t delay. 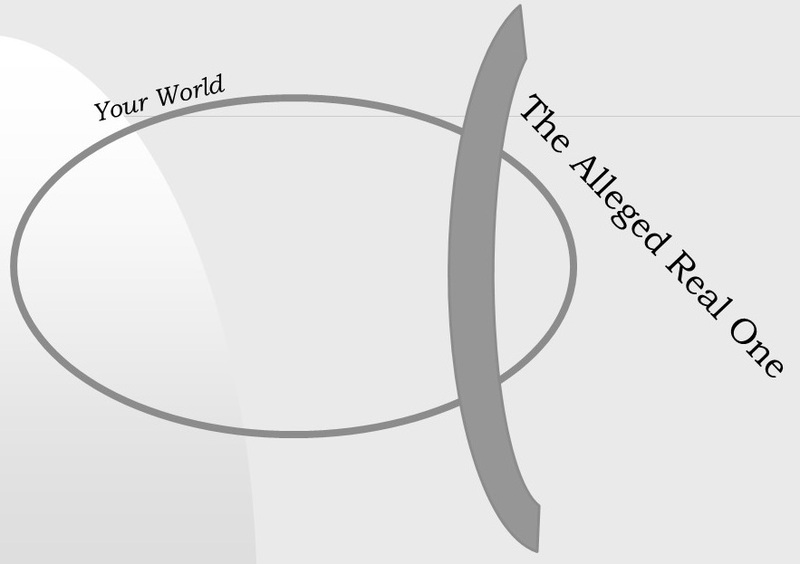 For my purposes, I recommend it today because the author here obtained (through very hard research) a metric ton of detail about “his” world, which happened to be 90+% identical to the Alleged Real one. Leroux researched the Paris Opera House of his day, and discovered hundreds of things that even Parisians didn’t know about the place. His tale is set almost completely within the confines of a single building, and yet in there is a murder mystery, paranormal romance, police procedural, comic mishaps, adventure and more. The characters range from an Olympian heaven to a Styx-like hell before it’s done, and if you just read the chapter with the rat-catcher I assure you, you WILL believe in spooks. This is an example of an enormous overlap between author-world and real world: Leroux’s additional material and characters were hardly even a stretch in his day. But there’s a ton of information the reader DOESN’T know that is ABOVE the red line. This put him in a fantastic position to bring the reader along to a detailed world where little things like having five basements, or an opera owning horses turn out to be important. Another cool thing to consider is that because of what I said just now, Phantom is almost literary fiction. He’s using “real” people and places with hardly any alteration, and yet there’s a “world” of stuff the reader has to understand. This is what today’s “high” fiction does right in this world: they write tales that take us into the inner lives of just a few people. I’ll say more about this in another installment but for now take my word, a human mind is also a world. You can do this. Review what’s in the draft and decide if it absolutely, positively must be presented to the reader. What you learned is never wasted. As an epic fantasy author, I have an online compendium where I store lots of encyclopedic stuff that I needed to find out (and loved finding out) but doesn’t fit well into any particular tale. Think about your current draft, whatever state it’s in between “once upon a time” and “the end”. It could be “the magic system” for a fantasy tale where wizards fight. Or “alien police procedure” for a sci-fi Sam Spade type detective story. Maybe “the best friend has a secret”– whatever word or phrase reminds you of it, that’s important. Try to put your hand on a half-dozen things that you can name, the bigger and more important the better. Write them down, and leave some room between each entry. We’ll come back to them in later installments of the world-building series. For Extra Courage Credit: list THREE things in the “southwest” quadrant, that you know, that the reader doesn’t know, and does NOT NEED to know. We will also discuss those things later on. Bonus point if you put something on the second list that’s already in your draft. Brava. There are blog posts, there are flash contest submissions, there’s a fan fiction seed. There’s the next tale in the series, you bet your life on that! But right now, right here, in this draft. quite possibly it’s below the red line. Some authors love to cruise around at cocktail parties and quip that you must “kill your darlings”. And if you hear that, I’d love it if you could kindly pour your drink down their pants and tell them I said hi. It’s almost never the fault of the characters, in my experience. But are they telling the same story that you were? Is this the story they should be telling? Or do you have them talking right now about something not germane to the current tale, something that maybe someone else should be thinking about instead? Easy to point out the problems! But this is the first step toward getting the world-building right and next we’ll dive into more detail about the when-how-where-who. You can do this. Better than anyone else, in fact because you’re the authority. Draw the line, start to respect it. There are no genre fiction encyclopedias! 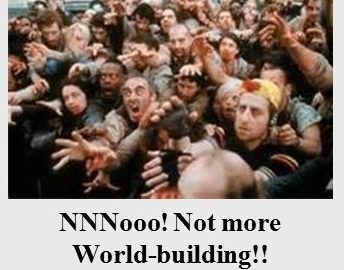 I just found your blog and will try to be here at my computer for the Sneaky World Building workshop. I am a playwright and working on a screenplay… I hope for a multi-episode TV show. Well thanks Robin! My first presentation of this workshop was already given in December, but I’m putting up the components of it as chapters here. I must say I never thought about applying this to cinematic, visual tales but the same notions should work- best of luck! Really enjoyed reading the series so far! I am really liking the “ peek behind the curtain”— I think it enhances my experience as the consumer of the art, whether I liked it or not. Marvelous! I never considered the potential use of such ideas in things like those great how-to model work articles you’ve written. But I do hope that readers also enjoy the notion of looking for the world in the tales they read. More of a scavenger hunt now on top of everything else! Thanks for dropping by.